When we moved into our house, we discovered remnants of a white quartz bed some previous owner had made. White quartz can look good around a swimming pool, but the closest thing we have to a pool is a section of lawn that floods for a month every spring. White quartz does nothing for swamps. I didn’t want to reuse the white quartz so I hid it behind an out-of-control woody shrub where no one would see it. Years passed; children were born; white quartz was forgotten and buried. I looked it over. “Yes, I suppose it is.” I’m not a geologist by any means, but quartz being a crystal sounds reasonable to me. “What? I thought we’d have at least $1,000 by now.” His enthusiasm was not dampened, meaning he was more interested in discovery than money, or more likely, I had proven my incompetence at valuing gemstones. At length, their dig led them closer to the stem of the bush, making the branches more of a nuisance. They retrieved a garden lopper from the garage. 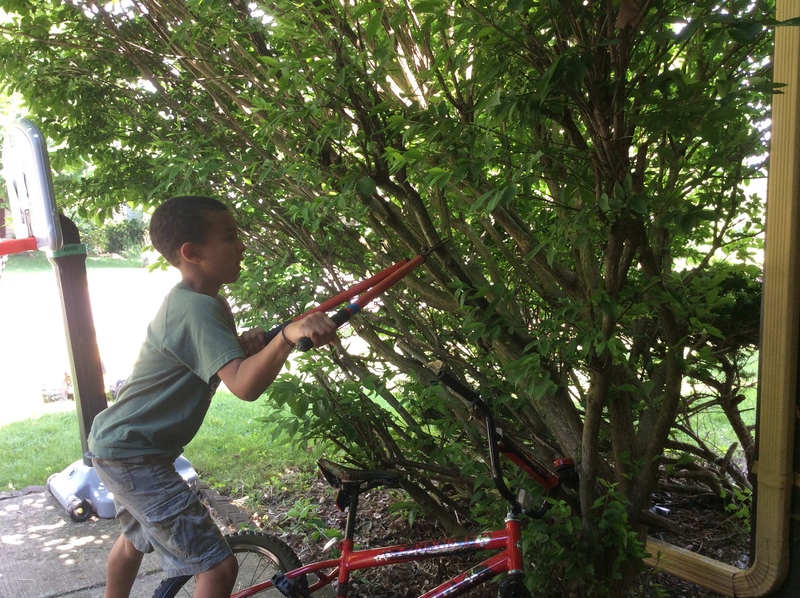 Big Brother began clipping off branches while Buster, tempted by the lure of greater treasure, was persuaded to the less glorious task of hauling them away. I let them attack the bush at will since it runs amok so readily as to need trimming every two minutes. This will look nice in the garage. Before long, the easy bits were cleared and thicker branches lay in their way. Big Brother began to strain as he struggled to squeeze closed the arms of the lopper. He gritted his teeth, grunting and groaning as the blade grew unwilling to cut any deeper. Sweat ran down his temples. From deep in his belly rose up prehistoric sounds of man’s epic battle against the forces of nature. Man’s never-ending struggle with nature. At last, he relaxed his grip and took a deep breath. “This is even harder than taking a big poop,” he announced. “Then stop making all those pooping noises,” Buster commanded. Big Brother gave the clippers one more quick try, but we all knew the battle was lost. The clipping was over. He learned a valuable lesson of manhood that day: when it’s the price of a sparkly rock, something harder than taking a big poop is probably not worth doing. This entry was posted in Little Weirdos and tagged boys, brothers, children, crystals, diamonds, family, fatherhood, humor, quartz, Sons. Not to worry Scott. Not only did the boys learn that mining for Milky Quartz—a stone second only in rarity to Red Volcanic Rock—is harder than a big bowel movement, they also benefited you too. 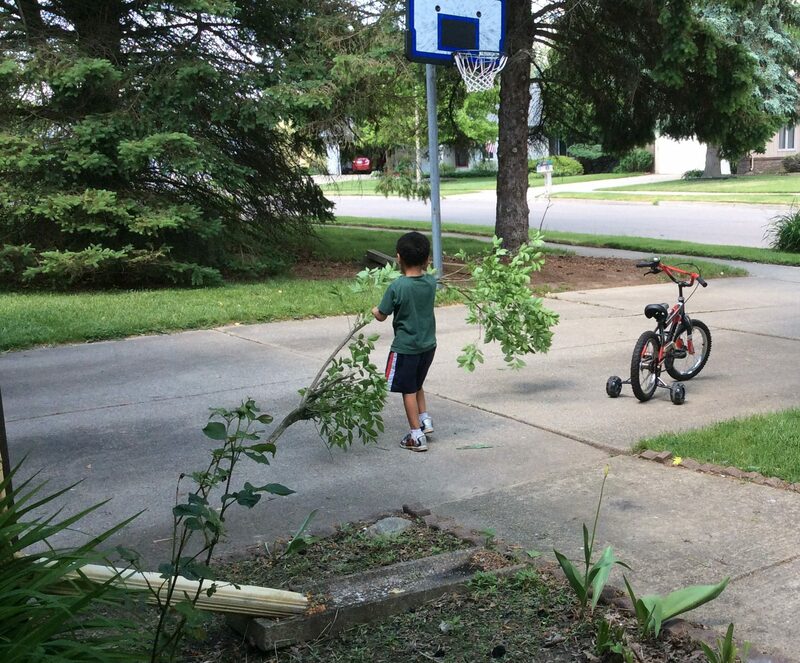 You managed to get all that pruning done without ever picking up a pair of shears! Men the world over will worship you for your clever ingenuity—that or carve your name into Milky Quartz. I’m now hiding valuable crystals everywhere I need something dug up or cut down. I have some raspberry bushes that need trimming around here. If bury a few stones around them, do you think you’re boys would trim em? They’ll do better than that. They’ll pull ’em right out of the ground for ya. Will have to ship C.O.D. Okay! They can even have some raspberries! Little freaks won’t eat raspberries. Oh no! Well can we tell them they are gum drops? I hope they’re stowing it away for such a day when the world might have a white quartz shortage! YOu never know when a tin of the stuff might become valuable. May as well bury the thing right under the bush again against marauders. Hopefully there will be pine cone and walnut shell shortages too, because we’ve got collections of those stored up in the garage as well. Marauders will never find any of our valuable stuff amidst the mess of our garage. A little constipation can change your whole perspective on life.